What does the condition of your parking lot or driveway say about you? In a home or business, the state of your asphalt sends a message to your customers and neighbors. Whether you like it or not, cracked, pothole-ridden roads and parking lots are a sign of neglect and an accident waiting to happen. Caring for your parking lot or driveway not only reduces liability, it also sets a good first impression. If you’re in need of commercial or residential asphalt paving services in the Colorado Springs area, look no further than Asphalt Advanced Services, LLC. Our team consists of the area’s the leading experts in asphalt paving. Don’t trust just anyone with your asphalt paving needs. Call Asphalt Advanced Services, LLC today at (719) 494-4894 for the Front Range or (970) 485-9333 in North & Western Colorado.to get a quote. Paving is the right choice for your home or business for a variety of reasons. Most importantly, from a safety perspective, a well-paved surface will provide the necessary traction to allow cars and pedestrians to navigate the area – a must for Colorado winters. Additionally, paving is fairly affordable. Since the materials we use are so cheap to produce, we’re able to pass that savings onto you, the consumer. Paving your driveway or parking lots and walkways is a cost-effective way to boost curb appeal. Finally, paving is also environmentally-friendly. Though it needs to be maintained, asphalt can be re-dug and used over and over again. This significantly reduces the amount of waste that’s produced in comparison to other surfacing options. In Colorado Springs and the surrounding area, our team is happy to provide your residential paving services. We utilize our state-of-the-art equipment and skilled work crews to ensure that your driveway and other surfaces receive the care that they deserve. Building a new home in Colorado Springs? Replacing an existing driveway? Looking to pave ya private roadway? Whatever the job, Asphalt Advanced Services, LLC can help you design a custom asphalt solution that best fits your needs. Contact us today to learn more about our residential asphalt paving service – (719) 494-4894 for the Front Range or (970) 485-9333 in North & Western Colorado. Commercial and industrial asphalt paving is our bread and butter. Our team has built a reputation working with local and large-scale businesses in the Colorado Springs area. No matter the project—big or small—we pride ourselves on offering excellent customer service, timely work, and quality results. From parking lots to street work, our team will be committed to your asphalt paving project from the start. Ready to schedule an appointment? Give our team a call at (719) 494-4894 for the Front Range or (970) 485-9333 in North & Western Colorado..
At Asphalt Advanced Services, LLC we work with residential and commercial clients alike. Every property comes with its own unique challenges and opportunities—but we’re up for the job. We get to know you and your asphalt project. Then, we’ll work together with you to provide you with exceptional asphalt pavement. Don’t see your project on the list? Give us a call. One of our team members can help determine how we can assist you with your asphalt paving project. Contact us at (719) 494-4894 for the Front Range or (970) 485-9333 in North & Western Colorado. 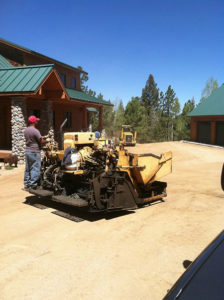 Need asphalt services in Colorado? We provide excellent customer service. Clients always rave about our excellent asphalt work and we are A+rated with the Better Business Bureau. Our affordable pricing and quick turnaround is just a plus.